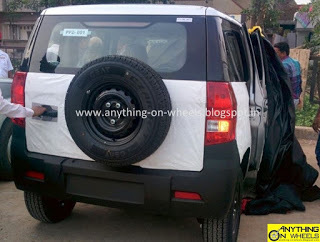 The first spy pictures of the upcoming Mahindra TUV 300 are out! Mahindra is expected to launch the car by September of this year and it is their first attempt at building a compact/urban SUV. The hard angles and square windows make the car appear quite masculine and are reminiscent of the Sumo from Tata. Even the wheel-wells have a squarish appeal to them. The front grille is a typical M&M affair with the vertical slats and the headlights looks really modern. 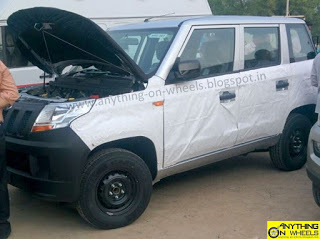 Check out the first drawings of the Mahindra TUV 300 here. Going towards the back and you see the gloss back D pillar to make the roof “float”. The spare wheel mounted boot door opens sideways. The tailights are again a really fancy affair and give the car a very modern look. Overall, the TUV 300 is inspired from many different vehicles, yet for a company like Mahindra to go out of their comfort zone and make such a modern looking design is quite an effort. We can’t wait to get our hands on this one. And soon! Combine all of the above factors along with the fact that Mahindra never goes wrong with the prices and that a AMT gearbox might be offered with the car, we know this thing is going to sell like hot cakes. UGLY!, it looked a lot better with all the camouflage hiding this ugly thing. It just looks too raw, rustic, unpolished and bare bones, may appeal to the minimalist sort, they should have just miniaturised the Chevy Tahoe design instead of creating this let down that seems to appeal more to an agricultural audience..